Celebrities were among the first to react after news broke that 'Empire' star Jussie Smollett will not be prosecuted by Cook County State Attorney's Office for allegedly faking a hate crime. Donald Faison, Loni Love, Marsha Warfield, and Joshua Malina were among the celebrities voicing their reaction to the dropped charges on social media. It's unclear at this time why the court decided not to proceed with the prosecution. Calling himself a man of faith, “Empire” actor Jussie Smollett said Tuesday that he felt vindicated after a stunning reversal by the Cook County State Attorney’s Office to drop all charges against him in an alleged hate crime hoax. Smollett was accused of faking an anti-black, anti-gay hate crime in Chicago in order to drum up publicity for his role on the Fox drama. News of the dropped charges came as a surprise to Chicago Mayor Rahm Emanuel and Police Superintendant Eddie Johnson. Both men angrily pushed back at the decision. “From top to bottom, this is not on the level,” Emanuel told reporters at an afternoon news conference. "Our officers did hard work day in and day out, countless hours workign to unwind what actually happened that night. The city saw its reputation dragged through the mud ... It&apos;s not just the officers&apos; work, but the work of the grand jury that made a decision based on only a sliver of the evidence [presented]," he continued. "Because of the judge&apos;s decision, none of that evidence will ever be made public." Johnson added, "If someone ever falsely accused me [of a crime], I would never hide behind a brokered deal and secrecy." Smollett, who posed with fans outside the courthouse soon after the news was announced, thanked his friends and family for standing by him. He also thanked the state of Illinois for "attempting to do what&apos;s right." “Not for a moment was it in vain. I’ve been truthful and consistent on every level since day one,” he said. “I would not be my mother’s son if I was capable of one drop of what I was accused of." Smollett called the attack and the months that followed "an incredibly difficult time." "Honestly, one of the worst of my entire life," he said. "But I am a man of faith and I&apos;m a man that has knowledge of my history and I would not bring my family, our lives, or the movement into a fire like this. I just wouldn&apos;t. Now I&apos;d like nothing more than to just get back to work and move on with my life. But make no mistake, I will always continue to fight for justice, equality and betterment of marginalized people everywhere." Smollett was initially charged with one count of lying to the authorities on Feb. 20. A few days later, a grand jury indicted him on 16 felony counts of lying to authorities — eight counts for what he told the officer who responded to the report of the Jan. 29 attack in downtown Chicago, and eight counts for what he later told a detective about being the victim of a brutal racist and homophobic beating by two masked men. Smollett claimed two men beat him, poured bleach on him and placed a rope around his neck before yelling, "This is MAGA country." A week before the alleged attack, Smollett told authorities he received a threatening letter at work. Chicago police pushed back and accused Smollett of faking the letter as well. The United States Postal Inspection Service told Fox News in a statement on Tuesday that it "is working closely with our law enforcement partners on this investigation." "We are unable to provide any additional comment at this time," the statement added. 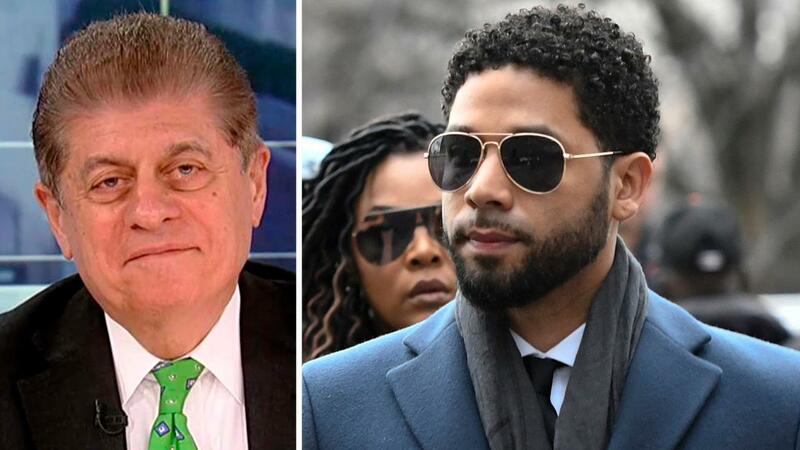 Fox News learned the judge on Tuesday granted a nolle pros, which essentially means that the case has been dropped and that Smollett will no longer be prosecuted for the alleged crime. It’s unclear at this time why the court decided not to proceed with prosecution. Typically, a minimum condition of dropping cases is some acceptance of responsibility. In a statement, the Cook County prosecutors&apos; office offered no detailed explanation. "After reviewing all of the facts and circumstances of the case, including Mr. Smollett&apos;s volunteer service in the community and agreement to forfeit his bond to the City of Chicago, we believe this outcome is a just disposition and appropriate resolution to this case," the statement from spokeswoman Tandra Simonton said. Doubt was cast on the open-and-shut nature of the case when Fraternal Order of Police President Kevin Graham wrote the Justice Department following reports that Cook County State&apos;s Attorney Kim Foxx asked Police Superintendent Eddie Johnson to let the FBI investigate Smollett&apos;s allegations that he was attacked by two masked men after the former chief of staff to former first lady Michelle Obama allegedly informed Foxx that Smollett&apos;s family had concerns about the probe. Smollett attorneys Tina Glandian and Patricia Brown Holmes said in a statement that Smollett&apos;s record "has been wiped clean."